It should seem obvious, but for many homeowners, it’s a slow crawl to needing an addition. It starts with the perfect house, then as your family grows and changes, so do your needs. Rather than move, you should consider putting an addition onto your home. There are many reasons for needing to expand, here are 8 of the most common. When you have a child, a new nursery can help everyone in the family settle down faster. If your mom or dad needs to be within the care of family, that in itself can be a challenge. An addition will give them their own place, but can be customize for additional needs. As your children grow older, they need their own spaces. Putting a new room or two onto the house can help to mellow out the family relations. A home office is not a luxury; if you are going to succeed, you may need to have a place to work that is separate and will be functionally productive. Adding another restroom, even a half bathroom, can make the house more useable and relaxed. Big box stores are popular because they offer shoppers a great deal. If you go shopping and buy less than you really want and need because of nonexistent storage space, you need to invest in an addition. Even a small pantry will work wonders. When you can’t see the floor of your living room, you might want to consider adding a den or family room. Your in-laws are staying for a month! A complete mother-in-law apartment can be a godsend if the in-laws or other family visit often. These are just a few of the many reasons that people put additions onto their homes. The overarching reason is that it’s significantly less expensive than moving to a new, larger home. 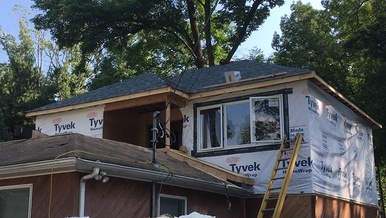 Regardless of reason, reach out to a licensed, insured professional to see how a home addition will be perfect for your family home.